From left: CIM team members David Zimmel and Nick Raway. A new team of 10 people is carrying forward our city-building work on the South Side of Indianapolis: leading prayer meetings, running men’s and women’s groups, visiting neighbors, renovating South Side homes and prepping for a wave of summer Action teams. • 10 to 20 neighbors attend the weekly Sunday evening prayer meeting. • Two men’s groups and two women’s groups meet weekly. • Five South Side neighbors—three men and two women—are underway in the new start. • The community and community members have acquired eight houses, including seven located on two adjacent blocks. The members of the team are now part of Christians in Mission (CIM), a recently reestablished unit of the Mission program office that will focus on building community in new start locations. Team members include experienced South Side residents, missionaries transferred from other locations and members with long experience in branch life. 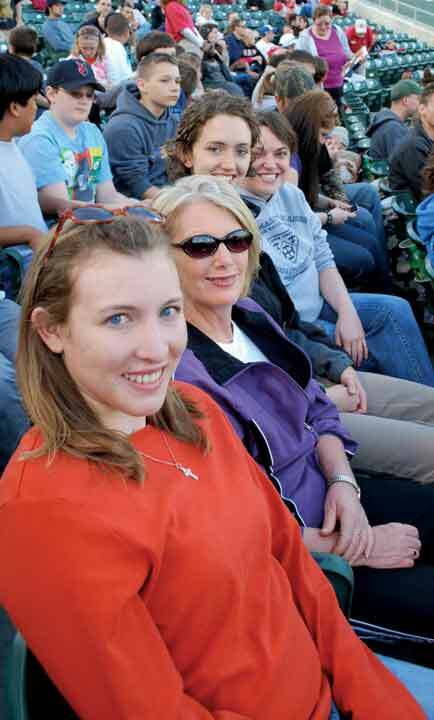 Members of the CIM single women's household take in a baseball game. From left: Angie Hass, Cathy Feehly, Naomi Caneff and Melissa Rader. Mission coordinator David Zimmel is in charge of the South Side work. “For three years, we’ve focused on meeting South Siders and talking with them about the Lord. Now our goal is to form the people we’ve met in Christian community life. Our objectives include teaching neighbors to celebrate the Lord’s Day, to participate in a men’s or a women’s group, to study and pray using the Christian Community Bible, and to join in our weekly prayer meetings. 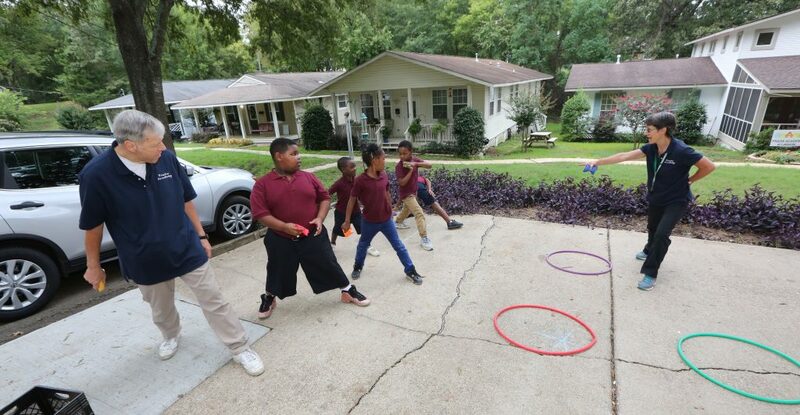 “Since February our team has formed households and found work to support ourselves. We live in three households, one for single men (Charles Chow, Michael Coney, Nick Raway, David Zimmel), one for single women (Naomi Caneff, Cathy Feehly, Angie Hass, Melissa Rader), and one married household (Ray and Robin Gonzalez). 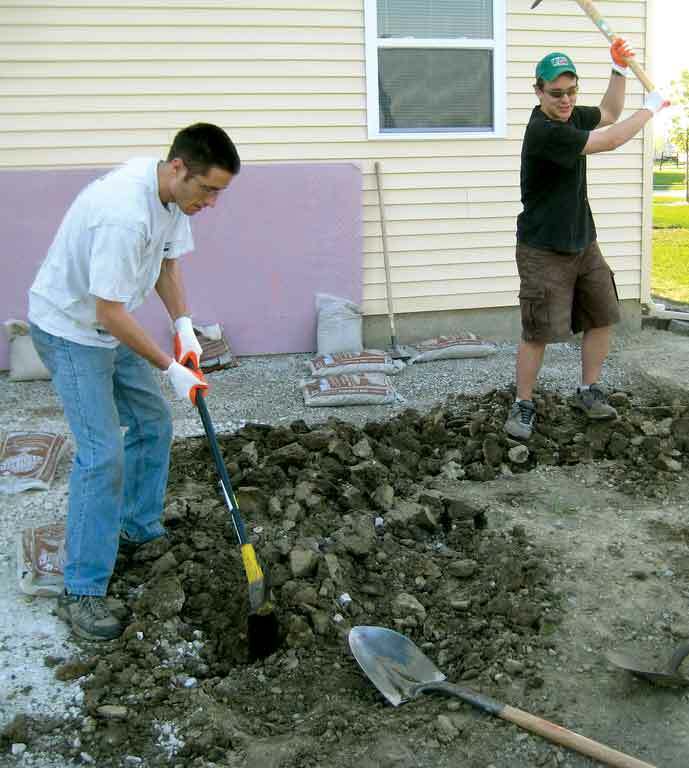 Most team members work full-time jobs; a few work part-time so they can free up hours for neighborhood work. Michael is overseeing renovations to two of the eight houses in the new start, along with a number of improvement projects on the other properties. Neighbor Larry “Gill” Gilliam has taken charge of renovating a bathroom in one of the homes. “He heard that we needed help so he started stopping by two or three times a week. He recently asked to come underway,” David says. Four Action teams will also help with the renovation work this summer. What a wonderful job you all are doing. I certainly love hearing all about it. God bless all of you for the wonderful work you are doing. We pray for you and the work you are doing every day. Keep the light shining! Amen to Paul's comments! Also, good article, Chris! Very exciting work! I hope we get to see the progress on the houses again soon and attend one of the Sunday night prayer meetings when we're in town. I say Amen to Paul and Mike's comments. I keep praying for all of you and Thurs nights we have intercessory prayer where we pray for you also. Baseball games? Men's Group? Lords Day's together? Working on homes? Sounds like a great life. Where do I sign up? Thanks for putting flesh on the vision of community life on the South Side. Great work. Sounds like your efforts are bearing great fruit for the Kingdom!! !Thanks so much for the updates. Thanks for the update! What great news! Keep up the good work-we pray for you all daily. It sounds like there is a hunger and a response to God's love, and word incarnate, there on the South Side. Keep planting the seeds and let "us" pray God pour out his grace, courage, confidence, energy, and wisdom on each of you as you work in the fields he has given us! We are encouraged by your boldness and inspired by your selfless love! With a heart full of praise I read of the work you are doing! The laying down of your lives for your new Brothers and Sisters in Christ! All Praise and Glory to God!